They are cosmetically matched to your other natural teeth and securely fitted so that they look and feel like your own natural teeth. Another advantage of implants is that no adjacent teeth need to be prepared or ground down to hold the new replacement teeth in place. It is possible to replace several missing teeth at one time using multiple implants. For example 2 implants may be used to replace 3 missing teeth by constructing a bridge anchored on 2 implants. 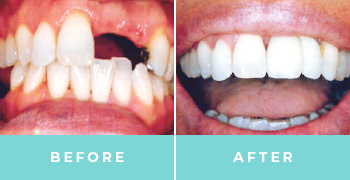 This is a more efficient and cost effective way of replacing multiple teeth.